National Eating Disorders Awareness Week 2016! Embody Carolina was thrilled to take part in this year's NEDA week and spread awareness of eating disorders and promote body positivity among the Carolina community. With the help of our fantastic campus partners including Active Minds at Carolina, Rethink: Psychiatric Illness, UNC Campus Recreation, Carolina Dining Services, UNC Campus Health Services, UNC Student Wellness, Carolina Advocating for Gender Equality (CAGE) and the UNC Center of Excellence for Eating Disorders, we were able to organize a week filled with events to educate about the impact of eating disorders and foster a more supportive environment for those struggling with eating disorders. To help promote NEDA's eating disorders screening, Embody asked UNC students, "what would you like three more minutes of?" Check out the photos from our pit campaign to see what they said! RSVP to our Facebook event to stay up to date on our NEDA Week activities around campus! You can also join the conversation online using the hashtag #unc4neda2016. Be sure to check out our daily blogs and participate in our social media challenge for the chance to win one of five prize packs! 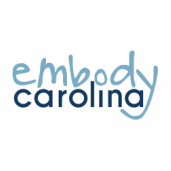 Embody also hosted a Social Media Challenge featuring daily themes and prize packs for 5 lucky winners that included goodies from our wonderful campus community partners, including UNC Student Stores gift cards, UNC Clef Hangers CDs, and free class passes to Red Room Hot Yoga. Check out our Instagram @embodycarolina to see the winners and search the hashtag #embody4nedachallenge to see all the awesome submissions we received!